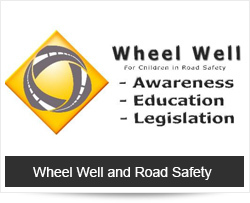 Wheel Well is the only non-profit organisation that focus exclusively on road safety for children and has been featured on 94.7 Breakfast Express during October 2012, Transport Month. Wheel Well strives to be the most visible, audible and effective change agent in Road Safety for Children in South Africa. To raise awareness, educate and effect changes and enforcement of legislation on issues surrounding road safety pertaining to children both in and around the vehicle. This will be accomplished through visible community and national campaigns/ projects. Wheel Well will align with partners and sponsors of like mind, whilst maintaining complete integrity and transparency in its activities. Wheel Well is the only a registered section 21 company. Application for exemption in terms of section 18A of the Income Tax Act is pending. Wheel Well is a Level 4 BEE contributor. The members on the board have sound and extensive experience in the Transport, Training and Financial Administration sectors. The common denominator of the members of the board of Wheel Well is their integrity and passion for Road Safety. Peggie is the face of Wheel Well and a social entrepreneur. Her empathy, compassion and propensity for cleaning makes Peggie the ideal person to head Car Seats for Kids and it keeps her motivated to be a change agent for children in road safety. Eugene has been involved in the motor industry for the past 31 years and has held directorships in several companies. Eugene's depth of experience and expertise in the industry as well as in Road Safety, add immeasurable value to Wheel Well. SJ is the owner of TD Administrative Services, a financial administration company for those underwriters who wish to outsource this function. Her strengths are her vast experience in financial administration, attention to detail and her honesty. Justine is the Business Partnership Manager at MasterDrive, a company in the Avis Group that specialises in Driver Training. Justine is not only passionate about road safety, but also brings her marketing and relationship managing skills to the table. Nick is a trained Child Line counsellor and has made his home available as a safe house in the past. The plight of children is very close to his heart. Nick is currently the member at NADM, a company that specialises in training and assessment. Nick is also a bookkeeper and entrepreneur, these skills and input are invaluable to a company such as this. Car Seats for Kids - This is a campaign where we raise awareness on the advantages of using seat belts and child restraints. The focus of the campaign is to collect used car seats for kiddies, refurbish them from top to bottom and then re-distribute them to families for whom the cost of this basic, yet vital investment in their child¡¦s safety is beyond their financial reach. The first level of benefit is for lower income families as recipients of seats. The spotlight on this issue raises the awareness of all income families to obtain car seats for their children. All parents reached by the campaign are encouraged to donate these seats back to the campaign. This keeps a steady flow of seats going and completes the circle of good will. The campaign was embarked upon in January 2012 with a launch on 12 April 2012 as a favour for a friend. The campaign immediately attract the attention of families and companies concerned with the safety of children. Wheel Well came into being to serve as a platform for this campaign as well as other initiatives to put the spotlight on children in road safety. Through media channels like 702 Talk Radio and Highveld Breakfast Express with the help of Imperial I-Pledge and Renault SA around 1000 car seats have been collected in 2012. More champions of this campaign can be viewed on the website. The seats are currently distributed from the garage at home as well as through activations at shopping centres, mock road blocks, at pre- and primary schools as well as at Road Safety events in conjunction with like-minded organisations such as Women in Road Safety. Over 500 Seats have found children to keep safe in the past year. Aspects of the campaign includes an advisory service on the correct choice of seat, correct installation and use, as well as a seat cleaning service. Keep the Car Seats for Kids campaign in the fore front with smaller monthly activations and bigger collaborations with Women in Road Safety and partners over Easter and December. Transport month with Imperial I-Pledge and Highveld in October 2013. Walk the Talk challenge carrying car seats for a distance. Start the ball rolling on research on the effects of collisions on children, the impact of morbidity on the family and gathering statistics on morbidity through an office at the CMI. Driver training for transporters of children. A documentary on road safety with the focus on children. Face Book Group:"Car Seats for Kids"